The US Congress failed to pass the $700B plan today, leading to risk aversion and a sell off in USD/JPY. It’s highly improbable that we will see my short orders triggered at 107.50 as the outlook for the Greenback and US interest rates are speculated to fall. So, I will close my open orders to short USD/JPY at 107.50 and look for another short entry point soon. So, further pain for the Greenback and carry trades? Probably so in the short term. Be cautious and stay tuned! It’s been a few days since I posted my thoughts, and no luck in getting triggered as the markets have been calm. This is mostly a result of traders hanging on the sidelines as they wait the outcome of the US hearings on the $700B bailout plan being proposed this week. So, expect more “Zzzzzzzzzzzzzz” until we see the decision on whether or not the plan will pass. So, I will continue to leave this orders open for now, but look for some short term range plays, probably for the rest of the week. Stay tuned! What’s up my Forex friends! I’ve got a few thoughts on USD/JPY to start the week of on with an idea that go from a swing trade to possibly a longer term position. Let’s take a look…. 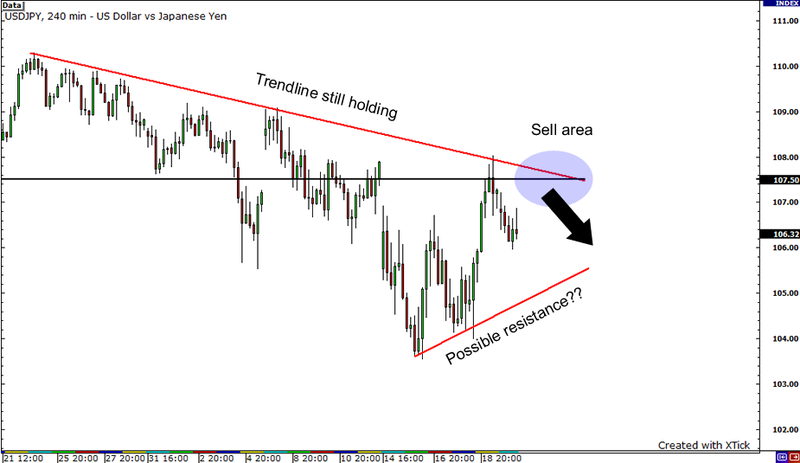 First, let’s take a quick look at 4 hour chart on USD/JPY. We can see that the falling trendline has held pretty strong since the end of August and the pair quickly reversed after touching it last week. I am short biased for fundamental reasons which I’ll touch upon in a sec, so if we see price action take the pair back up to the trendline, I’ll look to enter a short position there. Fundamentally, all markets are getting pushed around by what’s happening in the US as the government continues to throw hundreds of billions at the credit crunch to avoid a financial meltdown. This provided a boost to risk appetites last week, but will it continue? Will liquidity return to the markets? Are traders’ confidence in the system returning? Well, it looks like traders aren’t too sure as we are back to selling equities today and as money pours into commodities, like gold and oil, for a safe haven – not so good for the Greenback. Even bigger than that is the affect of taxpayer money to fix the crisis and the amount of debt added to the balance sheet of the US government. How attractive are US assets in the medium to longer term with this increased debt? Will we see taxes raised in the US and will it affect the consumer? There really isn’t anyone out there who knows what’s going to happen next, but what I think is that we are experiencing extraordinary events in the markets and this level of uncertainty could bring further rounds of risk aversion. Carry traders may continue to slowly deleverage until we see a bottom, which possibly means further movement lower for USD/JPY. If my position is triggered, and if the second profit target hits I am going to leave it open and use a 100 pips trailing stop to see if I can catch a run down further. So, let’s see if I can get a favorable price on this idea. Stay tuned for updates!